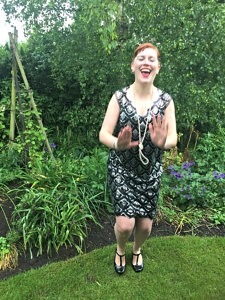 Dancing the Charleston in the rain | More blue fabric? 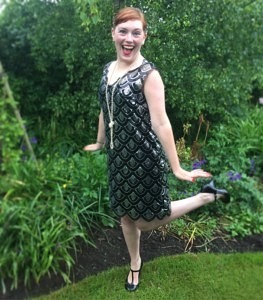 The party was wonderful, despite the almost torrential rain that fell on the day itself. 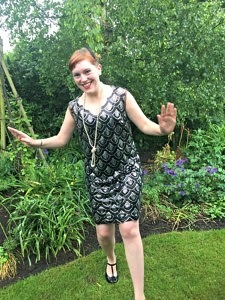 A bit of a blow when you’re having a garden party, but thankfully by late evening it had blown over and we were able to dance the night away under the stars – Charleston and all! A simple sleeveless shift dress. 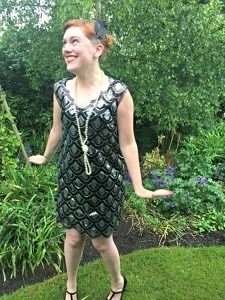 The fabric is a sequinned fabric that I bought at the rag market for the princely sum of £12 all in. I chose it because I loved the scalloped pattern and thought I could probably use that to my advantage. The slip dress underneath is RTW. 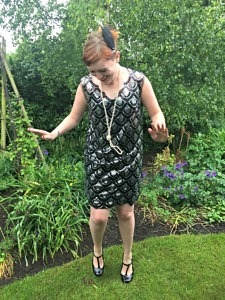 I used the McCalls M7533 pattern that came free with issue 40 of Love Sewing magazine. The only alteration I made was to take out the zip as it was loose enough that I could just slip it on and off. It was a super quick sew (yay!) and very satisfying to have a simple yet effective way to make the fabric look like a more professional item. There were sequins everywhere. There always are when I sew with sequinned fabric, but I always forget how bad it gets…. No. It was definitely a costume piece and, as a shape, this dress does literally nothing for me. There are women out there who rock a simple shift dress but I am not one of them; I really, really need a defined waistband. This scenario was fine, because it suited the style of the era, but I have no interest in making this again for day to day wear. < Previous If you don’t love yourself, how in the hell you gonna love somebody else?